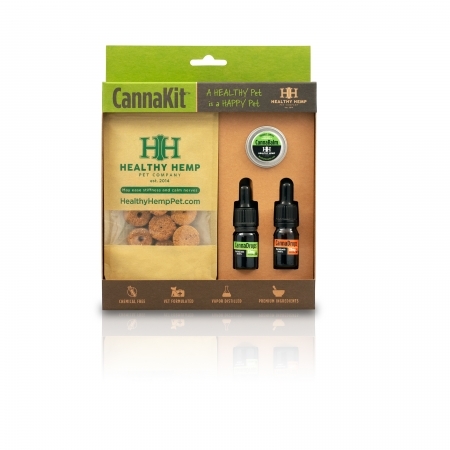 Healthy Hemp Pet CannaDrops™ Coconut offer animal owners and clinicians a more flexible and cost-effective way to administer larger doses of organic full-spectrum terpene rich PCR hemp oil. 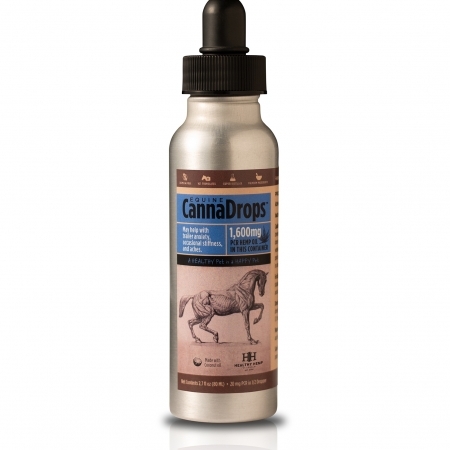 CannaDrops Coconut are small batch made right here in Salt Lake City, Utah. Syra’s seizures were dramatically reduced once she began taking CannaDrops. Thank you Healthy Hemp Pets. My dog is 14 years old, he has has now twice “old dog syndrome”. The symptoms look like this: A head tilt, an unsteady gait, loss of balance, or falling over, circling in one direction, eyes rapidly moving from side to side, known as nystagmus and sudden vomiting. Most vets will tell you to wait and see and give you only three days of anti-nausea meds. The first time around I did the meds and sat at home watching over my Rufus to help assist him around and house and outside. After the three days of meds I started him on CBD and watched his improvement happen faster. 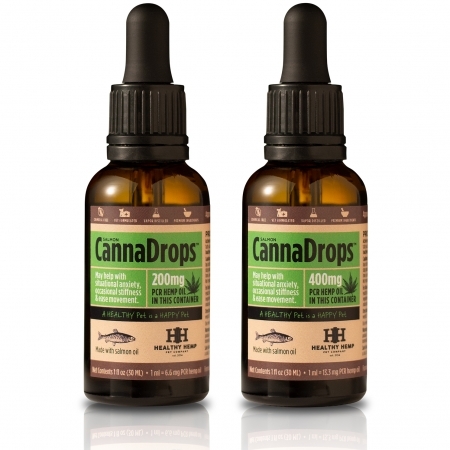 This time around I saw the symptoms and acted quickly with only using the CBD drops. His eye shifting slowed down within 30-45 minutes, by day three his walking was better (although he still needs help so he doesn’t fall), by day 4 his eyes are almost steady and his balance has improved to the point that I only need to walk next to him so I’m there to catch him in case he leans to fall . This stuff really works. It also helps with his hip discomfort. I highly recommend! I have struggled with my cat’s behavior all of his life. He is afraid of every noise, new people, and my other cat. When you walk by him, he hisses and spits and sometimes swipes at your leg or feet. It seemed that he was almost autistic, if that’s possible for a cat. I was at a cat show watching a friend of mine show her cat and she said, “Did you see the table out in the vending area that is selling CannaDrops? Maybe it would work for Mahri!” So, I bought a bottle of the coconut oil based 200 mg CannaDrop and crossed my fingers that it would work. I had tried everything, short of putting Mahri on prescription medication: food changes, litter changes, pheromone diffusers, large doses of catnip, his favorite treats…nothing had touched his crankiness. I had even considered calling Jackson Galaxy, the Cat Whisperer, to help. After using the CannaDrops for one complete bottle’s worth, Mahri is showing great changes in his behavior! I put it on his food twice a day, once in the morning and once at night. He is less anxious around my roommate, he loves on people he’s just met, his urination outside the litterbox has ceased, and he’s just a more pleasant cat! I know that this product was meant for dogs, but it definitely works with cats, too! Everyone knows that cats have very unique and aloof personalities, but Mahri was just terrified all the time and it didn’t seem like his quality of life was very good. CannaDrops has helped all of us in the house, and mostly Mahri. Thanks to your company, I can rest easier knowing that he is more comfortable in his own skin….or fur. Summer in general and 4th of July are usually tough for my dog Felony. He has panic attacks with fireworks, thunderstorms put him into shear terror. I am happy to say this year was a different story… we have noticed much calmer and relaxed dog since he started taking Cannadrops daily. I’ve also noted other changes in his general behavior such as not marking in the house when we are out and he is less agitated by other dogs. I am hopeful this change in behavior continues, thank you! My dog has hemagiosarcoma and prostate cancer and this has helped SO MUCH!!! We used the salmon oil spray before the coconut drops. He enjoys the dropper much more. It has helped his appetite and pain. Would highly recommend the dropper! This has helped my dog’s appetite and pain SO MUCH!!! We used the salmon oil spray before the coconut drops. He enjoys the dropper much more. Would highly recommend the dropper! We purchased our first bottle about 6 months ago at our local pet store after being told about it on Shiba Inu Crazy people on facebook. I have a 13 year old lab that I am his 5th home, he was high strung and very afraid of any loud noise as well as many other things. I have a 17 year old Shiba Inu that the pain meds were no longer working for her and could not give a higher dose without causing organ damage. We then got a 4 year old crazy lab that a friend no longer wanted. The 13 year old has no more noise problems and life is OK now for him. My baby girl 17 years young has her sparkle back in her eyes and getting around so much better in combination with her pain meds. My 4 year old just seems to make him more him, but calmer. Thank you so much for what you have done for us. Placing another order today. My 1.5 year old jack Russell was hit by a truck in November and her femur was snapped in half, along with pelvic fractures. The leg was saved and plated/pinned together. I started her on CannaDrops and felt she responded well. We moved, and she went about 4 days without her drops. During this time she was literally crying out in pain, and had to be carried down the stairs. After being started on her drops again, she is so much more comfortable and able to go up/down stairs without any issue! I won’t miss any more doses! I am so grateful for this product! Our 5yr lab has arthritis in both back legs and seasonal allergies. She was on gabapentin and tramadol twice a day and was drowsy and still showed signs of pain and discomfort. We started using this and have been able to stop the gabapentin completely and only give tramadol once a day. She is walking, running and jumping again! We are so thankful we came across this product!! I purchased Healthy Hemp Canna Drops for my two 8 & 10 pound Yorkshire terriers. Our quiet neighborhood gets terribly noisy with folks using illegal fireworks on July 4th. I’ve tried everything from thunder shirts to Benadryl which they throw up. My otherwise cheerful dogs pace, pant & crawl into corners trying to hide. My local vet wanted to prescribe “people downers” which I am against. I called Healthy Hemp & spoke to a very courteous fellow who advised I purchase the 200 mg. size. It was in my post box within days. I gave each dog half the directed dose & both settled down remaining relatively calm during the banging & booming that evening. Neither had adverse reactions; they simply cuddled in their blankets peacefully. I’ll have Canna Drops ready when the New Years eve nonsense starts as well. I am grateful that this product is available for their comfort. A friend gifted a bottle of CannaDrops to me to test out on my 3 dogs. 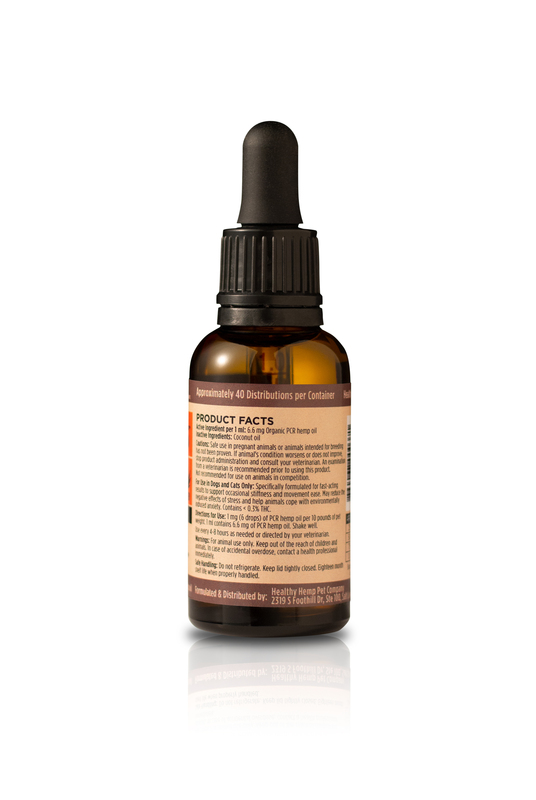 They have helped all 3 of them with their various ailments and anxieties. I’m 100% sold. 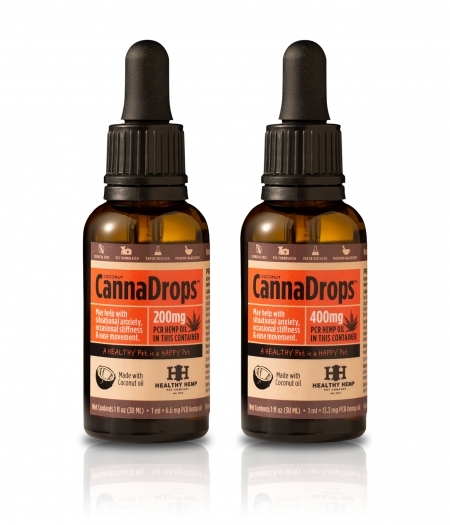 These drops have helped my dogs with serious medical issues, anxiety, and motion/car-sickness SO much more effectively than anything else I’ve tried. They think they’re getting a treat, but it’s actually helping them have a better quality of life. My 12-year-old Pomeranian has severe food allergies, liver failure, and a heart murmur; he’s been prescribed over 7 different medications to try and deal with these health issues but he was still struggling. I started giving him CannaDrops along with breakfast and not only did it help with his mobility and appetite, but he also was much more calm during vet visits/grooming/trips to the pet store. My 6-year-old Pomeranian has serious separation anxiety, and whenever I had to leave him at home he would bark incessantly (got to the point where neighbors were leaving angry notes on my door even if it had only been 15-20 minutes). If I did take him out with me, he was constantly on high alert and barked at people walking by, at cars, you name it. This past July, the fireworks scared him so much that he refused to come out from behind the couch for hours at a time. I gave him CannaDrops and he started napping through the firework shows! Plus, if I give them to him before taking him on an errand, he’s a sweet little angel that listens and doesn’t bark at anything that moves. My 3rd dog, a 7-year-old Chihuahua/Pug/MinPin mix, is a recent addition to the family. She’s sweet and quiet, but after a family drive through a winding canyon I discovered that she gets carsick. Even short trips around town cause her to unceremoniously empty her stomach all over the car interior. CannaDrops to the rescue again! I give her 1/2 tablet of Dramamine and some drops about an hour before a car ride and now she’s riding around town like a sweet, tiny princess. I have a beloved Border Collie that has shallow hip sockets. I have tried a number of options, and none of them really did much. I figured I had nothing to lose in trying this. In only a COUPLE OF HOURS, my girl went outside for a bathroom break and actually scampered down the hill to our lower yard. SOmething she has not done during the fall or winter in years. One half of a dropper of the 200 MG and she is visibly transformed. The limp is GONE from her bad side. She uses ALL FOUR legs to walk, not three, and not bunny hopping. I can’t express how thankful I am other than to say you won a loyal customer for life. I have seen people who use this product all the time and have said amazing things about it, but now I can say for myself it works great. I have a dwarf hamster who about a month ago began to grow a tumor on his face within a two day period it was vary large and obvious. So the next day I went and bought a 200 MG bottle and began giving him the smallest amount possible every other day because to how tiny he is. The tumor has not grown since and does seem to be changing in size, growing smaller, but it is hard to tell because he is so small. I am amazed at how fast it began to work and how this very fast growing tumor stopped growing. THANK YOU HEALTHY HEMP!